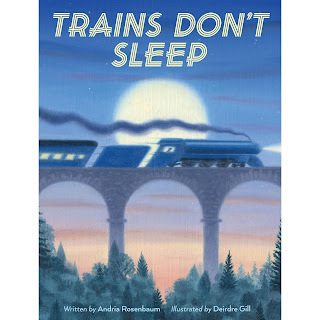 Today we are pleased to feature picture book author Andria Warmflash Rosenbaum, whose book TRAINS DON'T SLEEP, illustrated by Deirdre Gill (HMH Books for Young Readers) is coming out at the beginning of May. Be sure to enter to win a copy! I've wanted to be a writer since I first fell in love with words listening to my father reading to me and my siblings at night. I wrote my first picture book, which I still have, when I was 11, so it's been quite a journey for me. I think I'm drawn to writing picture books for their poetry, brevity and breadth. And of course for the incredible art, for which I have equal amounts of admiration and envy! Congrats on your forthcoming book, TRAINS DON'T SLEEP! Tell us about the story and what inspired you. I watched my first grandchild often the first three years of his life. When he was three he adored trains more than anything else. He'd play with them and talked to them and hold them in his tiny hand when he went to sleep. TRAINS DON'T SLEEP began in my head as I listened to him building an imaginary world for his trains. You've written several picture books. Has your journey to publication been long and winding, short and sweet, or something in between? Long, Longer. Longest. I didn't see the publication of my first book A GRANDMA LIKE YOURS/ A GRANDPA LIKE YOURS, Kar-Ben, 2006 until I was 40. (I do have 4 children who kept me a little bit busy in between.) Even though I gave up writing many times over the years I always came back to it. I really had no choice. I have to write. I tried to keep myself happy in the meantime by selling poems and short stories to magazines like Babybug, Children's Playmate, Cricket, Highlights, Ladybug, Spider and Turtle. I'm working on more picture books and also a middle grade novel. The hardest part is reading reviews and not allowing the negative to wound you. I'm not sure there's anything "easy" about writing, but my favorite part is revising. That's when the magic happens. Still, you have to write the words first --even if they're not very good--before you can revise. I tend to beat myself up when the perfect words don't come right away. That's probably my greatest fault as a writer. 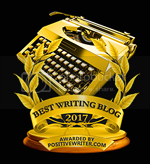 Writers need to be kind and patient, especially with themselves. So though there's nothing "easy" about writing, I think that's exactly what makes it so satisfying. A fully rounded story is a beautiful thing. Be kind and patient ;-), but most of all be persistent. READ! And join a good critique group. I always learn something about writing from critiquing the work of others. And remember that this industry is in constant flux. No matter how long you've been writing and think you know what works, accept that there's no sure thing. A sale has many variables that are out of your control. Focus on writing the best work you can and try to tuck a little slice of your heart into everything you create. I love to dance. I started taking ballet at 3 and haven't stopped dancing since. I'm also a pretty good baker, at least that's what they tell me ;-). Andria Warmflash Rosenbaum dreamed about writing picture books for children of all ages since she was eleven years old. She has a Master's degree in Special Education from Bank Street College and writes from her home in New Jersey. Her poetry and short stories have been published in Babybug, Children’s Playmate, Cricket, Ladybug, Highlight, Spider and Turtle magazine. Her short story called “The Color of Hope” won the 2008 SCBWI Magazine Merit Award for fiction. Her flip book called A GRANDMA LIKE YOURS/ A GRANDPA LIKE YOURS, published by Kar-Ben Publishing, Inc., Lerner Publications was a Sydney Taylor Book Award Notable of 2007. TRAINS DON'T SLEEP illustrated by Deirdre Gill is forthcoming 5/2/17 from Houghton Mifflin Harcourt. Though Andria's never been a train, she used to ride them frequently. She wrote Trains Don't Sleep for her first grandchild and his love of trains. Andria also has wonderful memories of her father running his Lionel electric trains for her and her siblings. BIG SISTER, LITTLE MONSTER illustrated by Edwin Fotheringham will be published by Scholastic Press in September 2017. While Andria is a big sister, she's claims to know nothing about being a little monster. However, she does admit to being well acquainted with her inner monster. Being kind and patient to ourselves is probably the best advice I should take. This advice applies to illustrators as well. Great interview Andria! I didn't know you're a dancer! Can't wait for your gorgeous book to arrive. I've had the opportunity for a sneak peak at this wonderful book--TRAINS DON'T SLEEP. It's a true winner. I'm so happy for you, Andria! Looks like a lovely bedtime story for those little train lovers!! Congrats! A new train book! and a wonderful interview! Thank you! I find the appeal of trains to both young and old quite fascinating. Wishing you the best of luck with this marvelous new release, Andria. Who doesn't love listening to trains at night rumbling down the tracks and sharing a whistle with those still awake. Andria, I look forward to reading "Trains Don't Sleep" with my 5 and 3 year old grandsons. Very attractive retro-looking cover! Thank you for the contest! Another wonderful book from Andria -- such a diverse group of wonderful books! Wishing you all the best. 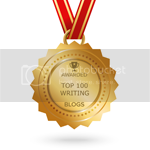 Thanks for sharing your road to publication and advice for other writers. I also enjoy revising the most and love when the right words hit me and make my story stronger. This book looks GORGEOUS! Can't wait to see it - and I really enjoyed your interview. Thanks! Thank you all for taking the time to leave such kind comments! This book sounds perfectly delightful! Looking forward to reading it soon! Congratulations! This looks like the perfect book for my new grandson (and his daddy who works for the railroad)! Congratulations! My youngest son is a huge train fanatic! Thanks for the chance & good luck to all! Looks amazing. Id love to win/read it! I just realized I NEVER came back here to say thank you! I love TRAINS DON'T SLEEP! I put thank you's on Twitter and Facebook...but not here. So sorry! Thank you, thank you, thank you! What a gorgeous book!